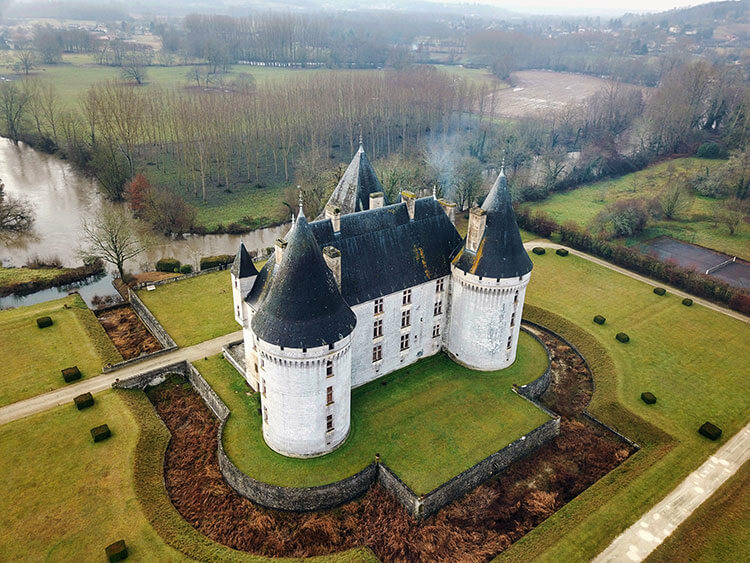 Known as the land of 1001 castles, the Dordogne-Périgord is not only one of the largest departments in France but also one of the most beautiful. Within this department in the Nouvelle Aquitaine region just 50 miles east of Bordeaux, lies the world renowned Périgord. Arguably, some of France’s best culinary products come from the Périgord. Foie gras, chestnuts, AOC label walnuts, Périgord strawberries and the wines of Monbazillac and Bergerac are all produced locally here. And in winter, black Périgord truffles are ready to be harvested from the roots of the oak, hazelnut, chestnut, popular and birch trees that they grow on. 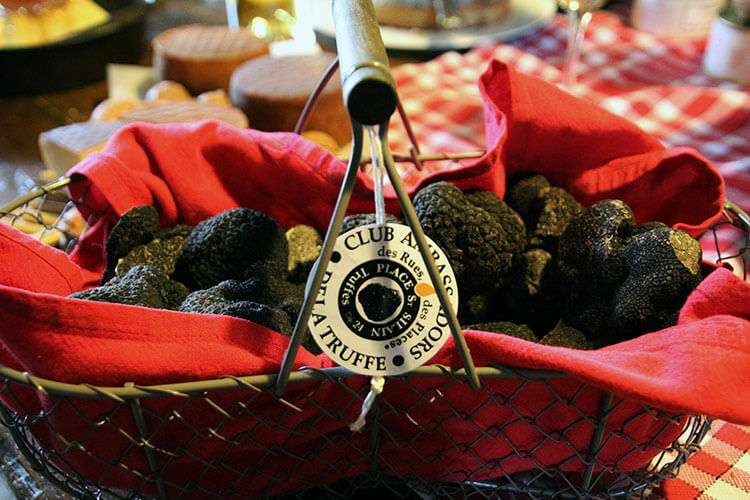 Truffle hunting in the Perigord brings a bounty of the black diamonds to markets and innovative dishes to the tables throughout the department. From November through April, truffle lovers can enjoy villages virtually empty of tourists and the truffle markets, truffle hunting, truffle-themed cooking classes and the culinary delights of the Dordogne-Périgord. One of the best ways to learn about not only Périgord truffles, but all 40 varieties, is at The Ecomusée de la Truffe in Sorges. It’s a museum entirely dedicated to the truffle. The museum opened here in France’s Capital of the Truffle in 1982 and the only of its kind in the world. It’s recently been completely renovated with all new and interactive exhibitions that take you on a journey of discovering the natural cultivation of the truffle, as well as it’s culinary history and association with wealth and the finest things in life. Second only in value to the rare Alba white truffle from Italy, black Périgord truffles are the most expensive food in the world. 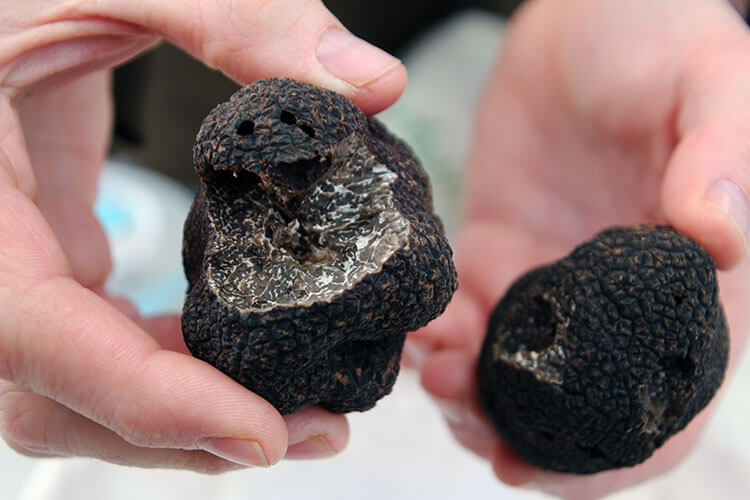 Though there are other species of black truffle, they aren’t held in as high regard as the species Tuber Melanosporum, which the Périgord lent its name to. So how did the Périgord come to be the Capital of the Truffle? Truffles themselves date back to ancient times, and were recorded in Ancient Egypt. Writings indicate that the Pharaoh Khufu, who built the Great Pyramid of Giza and reigned during the 4th Dynasty, offered truffles to dignitaries. France’s own truffle history dates back much further than Sorges’ love affair with the culinary black diamond. We’d previously discovered on our truffle trip to Provence that it was Francois I that brought the truffle to his table, remaking the truffle from a peasant food that was often eaten like boiled potatoes to that a culinary gem worth its weight in gold. But it was Sorges where trufficulture, or the modern farming of truffles, was born in the 19th century. It really began with Baron Bertrand de Malet planting 60 acres of oak trees between 1837 to 1868. His farming techniques were successful and other truffle farmers followed suit. Truffle farming quickly replaced wine making, which had collapsed due to the spread of phylloxera, as farmers replaced their infected vines with truffle oak plantations. By the end of the 19th century the hamlet of Sorges was recording annual harvests of six tons of truffles. To put things in to perspective, that six tons is equivalent to about the entire truffle harvest annually in all of the Dordogne-Périgord today. The black Périgord truffle is actually more of a grayish-black or brownish-black on the outside, with white spidery veins on the inside that indicate maturity. Much as wine is interwoven in to the lives of the Bordelais, truffles became the way of life of the Sorgeais, providing a significant income to the farmers there. The world’s premier truffle experts have come from Sorges within the last two centuries. Sorges, indisputably, earned its legitimacy as the Capital of the Truffle as this culture of all things truffles has been passed down through the families there now for over two centuries. Other countries have tried to cultivate truffles, though it’s not as easy as planting seeds and waiting for your crop to grow. Even when tree plantations are planted with the proper varieties of “truffle trees,” truffles still grow naturally only under the right conditions. It’s the combination of European red soil, which is prominent here in the southwest of France, along with rainy summer days that produce the earthy, richly flavored black Périgord truffles. It was only about 100 years ago that France produced around 2000 tons of truffles annually, but today it’s closer to 30 tons. Climate change, wars and disease have changed the French landscape, leaving less trees for truffles to have a symbiotic relationship with. The Ecomusée de la Truffe is a fascinating visit with explanatory panels, photographs, videos and tools all related to how truffles grow, the various ways that they’re harvested and how they’ve become the world’s culinary treasure. Though the exhibits are in French only, English speaking visitors can request an iPad with all of the exhibitions in English from the reception desk. Guided visits are also available. 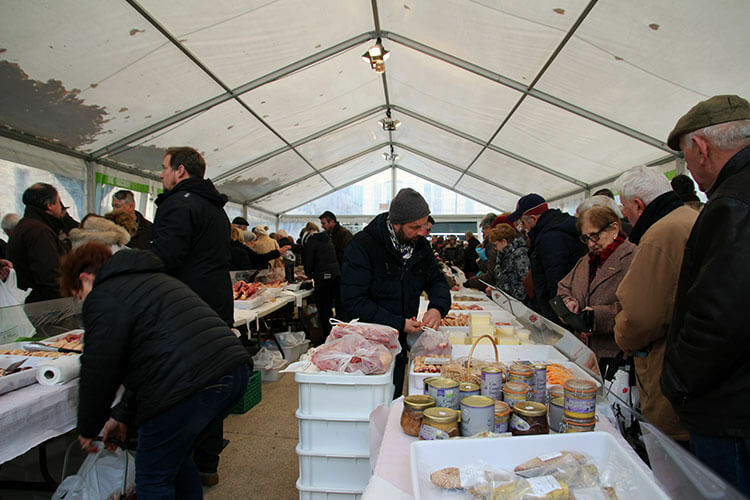 Périgueux is France’s capital of foie gras, but the winter weekly markets also feature another culinary treasure: the Périgord truffle. Tucked in to the back of tent on Place Saint-Louis, a controlled truffle market takes place every Saturday from 8am. 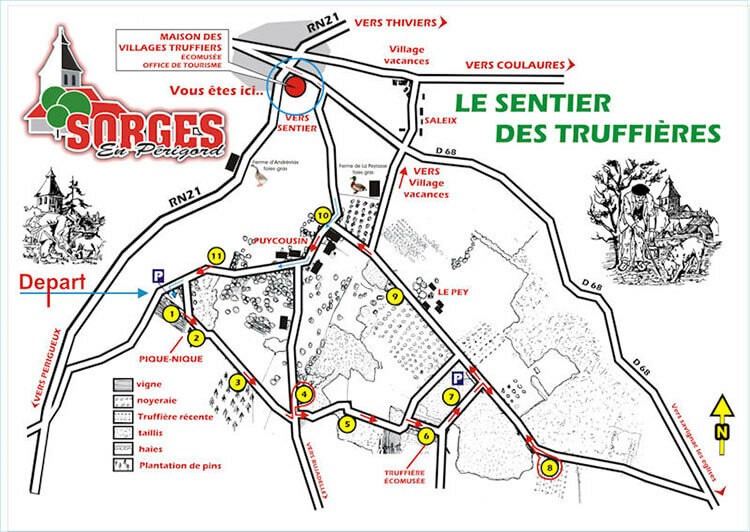 Unlike the Marché aux Truffe Richerenches in Provence, the Périgueux truffle market is open to both the public and professionals. Périgord truffle producers are lined up, each displaying their recent truffle hunting haul. Truffles in all sizes give off an intoxicating scent. The Marché aux Truffes on Place Saint-Louis is the spot to buy a truffle in Périgueux, but it’s not the only market happening on a Saturday. There are markets stretching all throughout the old town with delicious Périgourdian delights for sale. 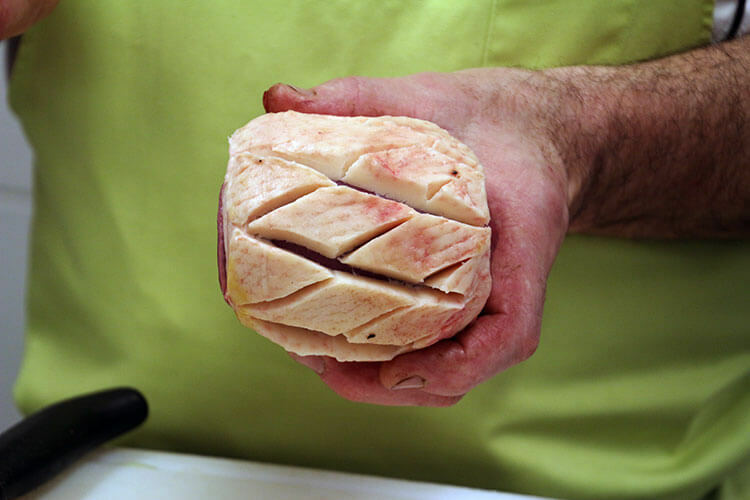 You’ll find all things foie gras like fresh foie gras, foie gras stuffed figs and the famous pâté de Périgueux. The weekly controlled truffle market every Sunday from 10am in Sorges is quite the spectacle. Everyone from professionals to truffle-loving tourists just curious about the whole process begin queuing up at least 30 minutes before the doors even open. 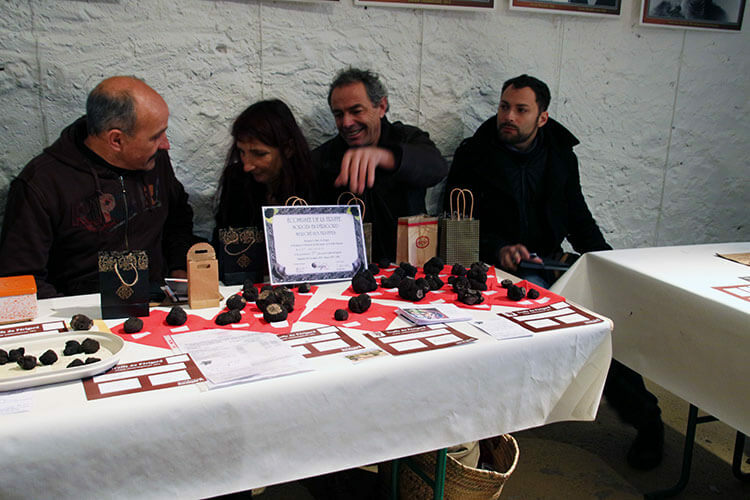 The Fédération Départementale des Trufficulteurs (Federation of Truffle Farmers) checks the quality of the truffles and makes the rounds to each truffle producer before the market opens. Once the doors are finally opened to the queue outside, all the producers stand up like a finely orchestrated ballet as the dance of which truffle is best to buy commences. Outside, a small market with local winter produce, fish and oysters from the coast and, of course, foie gras is there to entice the truffle market goers with the rest of what they might need to prepare a Sunday afternoon feast. In the heart of Sorges and just steps away from the truffle market and new Écomusée de la Truffe, there’s a classic French inn aptly named Auberge de la Truffe. It is an essential stop for all truffle loving gourmets. 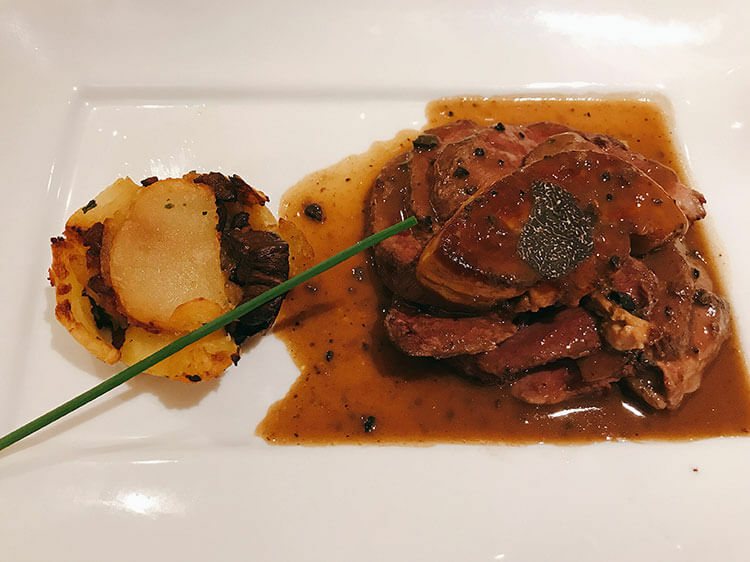 Auberge de la Truffe’s owners, unsurprisingly, are passionate about the truffle, as evidenced in their winter truffle menu dedicated to the culinary diamond and organization of truffle activities in the Périgord for their guests. Auberge de la Truffe was our own base for our truffle fueled trip to the Périgord, and one of the activities we took part in was a truffle themed cooking lesson with the inn’s chef. The day begins with a visit to the Marché aux Truffe in Perigueux with Chef Pierre to secure a haul of black truffles that will be used over the next couple of days at Auberge de la Truffe’s restaurant. You also have time to explore the open air market stretching throughout the Old Town, which is the most famous market in the Nouvelle Aquitaine with its’ fruit and vegetable stalls, flower vendors and foie gras producers. 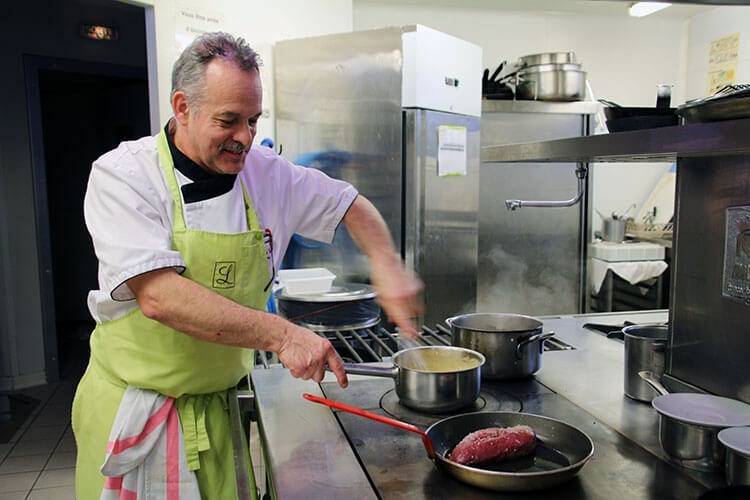 In the afternoon, we once again met Chef Pierre for a cooking lesson preparing all of the dishes on Auberge de la Truffe’s famous truffle menu. As we observed, the restaurant is packed nightly with locals and tourists alike to enjoy the menu boasting 50 grams of truffle per person. Chef Pierre not only demonstrated how to turn this sought after fungus in to a delicacy, but also important French cooking techniques like how to score a duck breast so it properly renders the fat as it cooks. With a folder of the recipes we’d each take home from our cooking lesson, we prepared a portion large enough for everyone in our small group to get a taste of dish on the truffle menu. Scrambled eggs became decadent as truffle was grated in to them, scallops were rich stuffed with truffle and drizzled with a truffle cream sauce, and the duck two-ways and topped with truffles was delectable. The cooking lesson isn’t merely a tease, though. After being behind the scenes, it’s time to move to the dining room and enjoy the full truffle menu. What exactly does a menu with 50 grams of truffle per person look like? 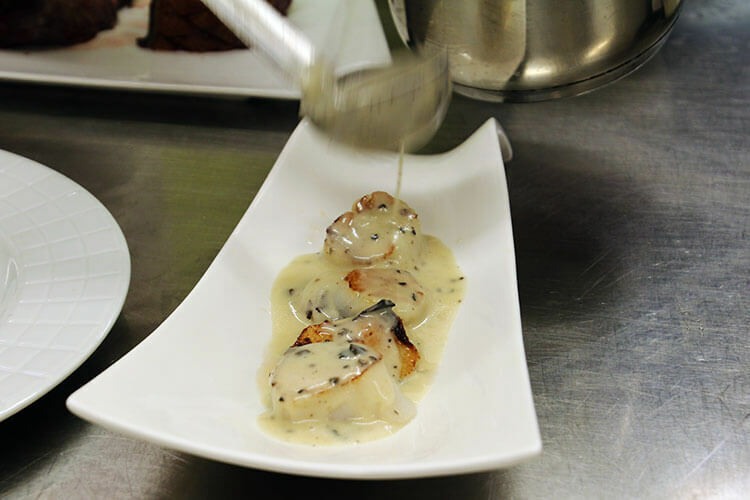 It begins with a celeriac soup topped with truffle cream and garnished with shaved truffle. Scrambled eggs loaded with grated truffle and garnished with yet another shaved piece of truffle follows, then the plate of truffle stuffed scallops in the rich truffle and saffron cream. It all culminates to the crème-de-la-crème of the meal: the duck breast topped with foie gras and truffle cream sauce. If a cooking lesson doesn’t tickle your fancy, the truffle menu can still be enjoyed at Auberge de la Truffe’s restaurant during the winter months. We just suggest making a reservation, as people came from far and wide to fill the restaurant nightly. Perigueux and the Périgord can be reached by train in about 4 hours from Paris or 1 hour 30 minutes from Bordeaux. It’s best to rent a car to freely explore the Dordogne-Périgord. Auberge de la Truffe in Sorges, which is located about 19 kilometers from Perigueux, is an excellent base for exploring the Périgord. The hotel can arrange various truffle and foie gras activities for guests in the area. Mention Luxe Adventure Traveler at Auberge de la Truffe and you’ll receive a complimentary glass of champagne with dinner. Our trip was provided by Dordogne-Perigord Tourisme in order to bring you this story. However, Luxe Adventure Traveler maintains full editorial control of the content published on this site. As always, all thoughts, opinions, and enthusiasm for travel are entirely our own. This article contains affiliate links. When you book on Booking.com , Oui SNCF or RentalCars.com through our affiliate site, we earn a small commission at no additional cost to you. Great article! I know absolutely nothing about truffles but this article inspired me to do some research. I’m also looking for a gourmet restaurant near me that serves truffle dishes. Hardest part will be finding the real thing in the US. Keep up the good work. Wow, this is like taking a course on Truffles. You have not only explained the Perigord truffles but also the other coveted and not so coveted truffles. I remember reading somewhere that they use hunting dogs for spotting truffles in Australia – do you think that is a myth or a real story? Let me start by saying, your first picture of Château des Bories is so amazing! I\’d love to visit the city with 1001 castles (do they really have that many?) because of the castles as well as the mouth-watering truffles. 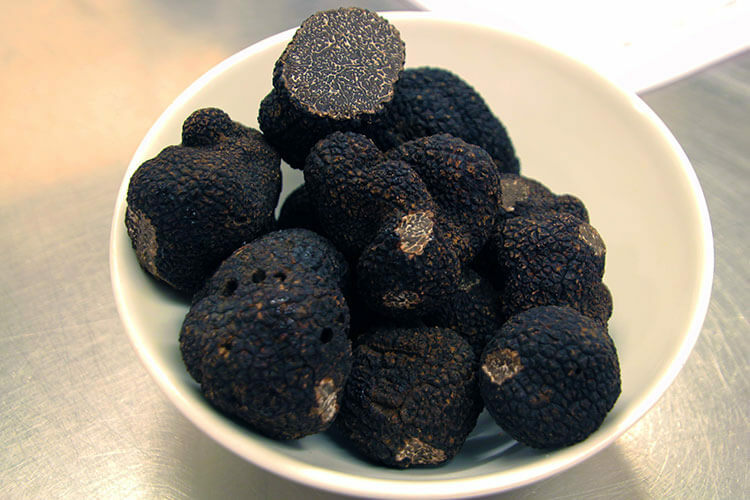 The Perigord truffles look oh-so-good! I don\’t think I\’ve ever eaten a truffle before but I know that they\’re considered to be the height of luxury. I find it interesting that it\’s difficult to grow in other parts of the world because they don\’t have the right soil and rainfall. I imagine that drives up the price quite a lot because they\’re an \’exclusive\’ luxury item. The truffle market sounds interesting and I like that officials do a quality test before they allow buyers in to make purchases. It shows the attention to detail and the prestige of truffles in France. This looks a perfect trip for foodies. Truffles produce such a great flavour when used by a good chef, we will leave the cooking to someone else. We may have a chance to get to Dordogne later this year so it would be great to explore the region and taste the excellent food and wine. Wow, Périgord really is a foodie capital, thanks so much for putting this on my radar! I’ve never eaten truffle (I don’t think! ), but I’ve seen quite a few programmes about wild truffle hunting and always thought it seemed like something I’d like to know more about. Now I do – thanks for such a thoroughly interesting post! Thanks for this very informative post about truffles! I love the pictures of food, they all looked so scrumptious, seriously mouth–watering foods perfectly infused with truffles. I love also the photo of 1001 castles, landscape of the Dordogne, outstanding view from above! I think I may need to take a trip to Périgord in France as it looks beautiful and I’m sure all the food and wine taste amazing. You are making my mouth water as I read. I love truffles so a truffle themed cooking lesson with the inn’s chef sounds like a dream. Your first picture of Château des Bories is just amazing! Firstly the Land of 1000 castles and then the museum dedicated entirely to truffles – that is really interesting. The black Périgord truffles are so tempting. It is actually a luxurious item. Would love to visit and taste truffles in the future. I never knew anything about Truffles though I did know that it was one of the most expensive food in the world. Your fascinating post has given me a lot of information and now I realize why Truffles are so expensive and why Perigord Truffles are world renowned. Definitely, a very exhaustive and detailed post which comes as a breath of fresh air. Hunting truffles now a days is likely becoming a trend not just because of the the variety of culinary use of it but it also comes with a very high price tag. A lot of people would pay extra just to get a hold of a very delicious, delicate, and hard to find truffles.